Now I’m not making fun of the anonymous person who made the mathematical error. We are all human and make these kind of mistakes everyday. I remember Russell Crowe making the exact same mistake on Jay Leno whilst discussing the U.S. Bank bail outs in 2008. It’s certainly possible that one of you reading this very post was unsure who was correct when you started (but hopefully it was crystal clear by the time you reached the end). But I’m quite confident that everyone reading this exchange knew the problems were entirely the result of human error and not anything to do with the uncertainty that multiplication and division were sound principles that could be relied upon. I’m sure no-one, at any point, lost their faith in the principles of mathematics. (If anyone did, please post a comment. :-)) This meme made think of Young Earth Creationists and Radiometric dating. Young Earth Creationists believe the first chapters of Genesis are a literal retelling of a God’s creation of the universe. Everything was created in 6 earth days, and using the genealogy laid out in the Bible they have calculated the Earth to be less than 10 000 thousand years old. As such they must attempt to refute (or else ignore) any evidence to the contrary. Evidence like the constant rate of decay that can be measured in certain unstable isotopes, which can be used to determine the age of rocks on this planet, and by extension, set a minimum age for the Earth, and therefore the Universe. 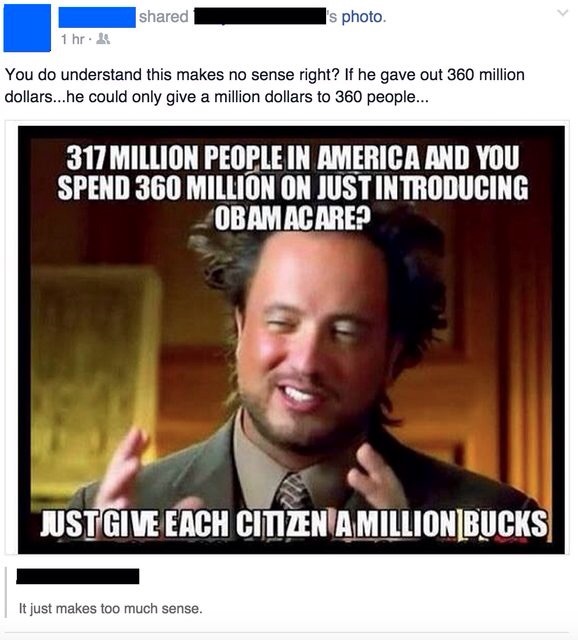 Math is reliable, despite the meme above. Baking is reliable, despite the odd kitchen disaster. Radiometric dating is a time tested (pun intended) scientific process, despite what Bible literalists tell you. The exceptions do not prove the rule.